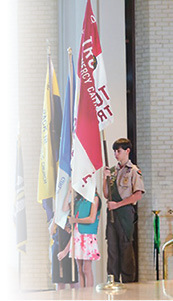 The Catholic Committee on Scouting hosted its annual Religious Emblems Award Ceremony on Aug. 28 at Our Lady of Mercy Church in Baton Rouge. Bishop Robert W. Muench officiated with the help of Deacon Richard Grant. Bishop Muench spoke to the scouts about challenges in their lives and always striving to do better. He also encouraged them to choose Jesus as their model of a responsible scout. A total of 154 Boy Scouts, Cub Scouts and Girl Scouts from 31 units earned their religious medals. Girl Scouts medals were awarded for the new God is Love emblem for kindergarten and first-grade girls, also the Family of God and I Live My Faith emblems. For the Cub and Boy Scouts, medals were earned for the Light of Christ, Parvuli Dei and Our Lady’s Award. Several units were unable to attend because of the recent flooding, but the CCOS committee will visit their church parishes to award the emblems at a later date. 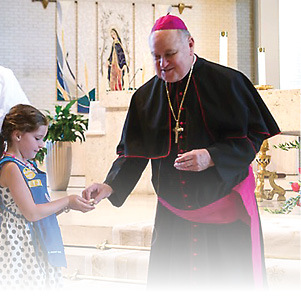 Four adults were awarded the Bronze Pelican Award developed to acknowledge men and women who contribute directly to the spiritual nourishment of Catholic boys and girls in the scouting movement. This year’s recipients were Genny Gohn, Erin McLean, Patrick Tullier and Ron Usie. 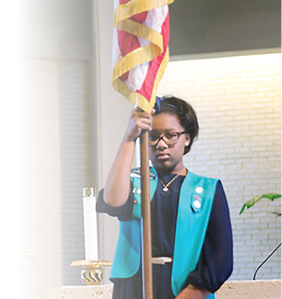 Girl Scout Troop 10460 from St. Jude Church in Baton Rouge received the Light in the Lord, Bishop Stanley J. Ott Service Award. This is awarded to scouting groups who demonstrate service to the community, in keeping with the ideals lived and preached by Bishop Ott. Troop 10460 created a group project to earn money for Baton Rouge area animal shelters.